We are announcing the development and release of a new report to manage chemical coatings and finishing data: Report F230X. This report is now available through the ERA-EMS reporting menu. A sample display of report F230X, with fields customized by the user (CLICK for larger view). F230X is focused on providing the most flexible and customizable reporting possible, enabling you to determine the content and display of the report, including a level of customization not available in other emissions reports. When using F230X, you have full control over the content of the report, and can choose to generate the report according to source, department, facility, group, or all 4 options. You can also decide to organize the outputs from these data sources into these same categories. 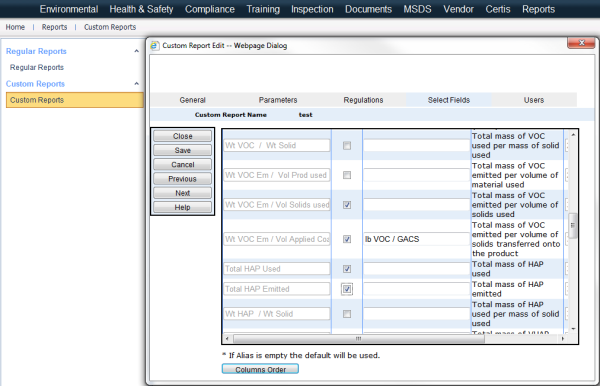 This feature allows you to drill down or get a bird’s eye view depending on your reporting needs. You only need to see those materials that you are interested in. Further customization is built-in, as you are able to choose which fields to display in the report and the order in which their columns appear. You are also able to define your own titles/headers for each field. To select which ones to display, simply click the check box next to each desired optional field. The new F230X Report allows you to display only the fields you care about using a checkbox system. 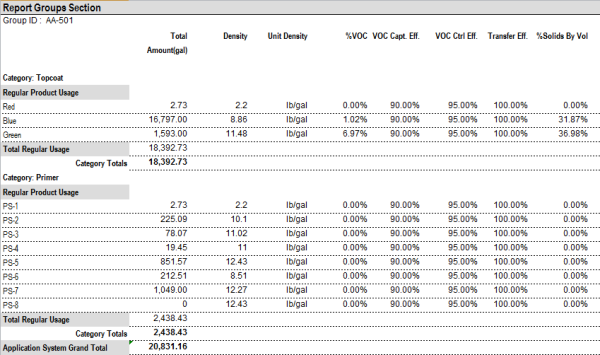 In this example the user only wants to see four fields displayed. Keep in mind that you have the option of changing the labels associated with all of these values. Permit compliance: This report is easy to customize to match your unique permit conditions that may not otherwise be reflected by a single ERA built-in report. For example, a permit condition may require you to keep VOC emissions within a certain limit for a group of sources (a paint shop for example), and F230X makes it easier to drill down to that level. Internal Reporting: Some users find that this report simplifies internal reporting of emissions on a monthly, annual, or even daily basis. It can be customized to show only the information you are interested in or that senior executives are interested in. Benchmarking & Reductions: In addition to internal reporting, this report can be used on a regular basis for side-by-side comparisons and tracking emission reduction efforts. Because this report is designed for flexibility, it can be used for numerous other purposes as well. Do not hesitate to experiment with ways to implement the new F230X report or to contact your ERA support agent for advice.